NIH researchers use CT angiography to link arterial plaque with diabetes. A new study from researchers at the NIH Clinical Center has found that non-calcified arterial plaque is associated with diabetes, high systolic blood pressure and elevated ‘bad’ cholesterol levels in asymptomatic individuals. The team state that Coronary Artery Disease (CAD) is the leading cause of death in men and women worldwide, accounting for 17 million deaths annually. Current treatment strategies focus on cardiovascular risk and serum cholesterol levels rather than direct assessment of extent of disease in the coronary arteries. They go on to explain that plaque that forms in the arterial walls can restrict blood flow and, in some cases, rupture, leading to potentially fatal heart attacks. There is considerable evidence that calcified, or stable, plaque is less prone to rupture than non-calcified, or soft, plaque. Intravascular ultrasound can quantify non-calcified and calcified coronary artery plaque, however, it is invasive and unsuitable for screening purposes. Previous studies have shown that Coronary Artery Calcium (CAC) scoring with CT, a common noninvasive option, measures how much calcified plaque a person has, however, it doesn’t measure non-calcified plaque, and that’s the component that tends to be dangerous. Despite treatment for hypercholesterolemia (high levels of cholesterol in the blood), CAC scores often paradoxically increase. Thus, researchers have searched for other plaque measures that can identify treatment response. Most information to date about coronary artery disease and cardiovascular risk factors in asymptomatic individuals has been derived from calcium scoring, state the team. So they hypothesized that risk factors for the presence of non-calcified plaque may differ from those for calcified plaque. 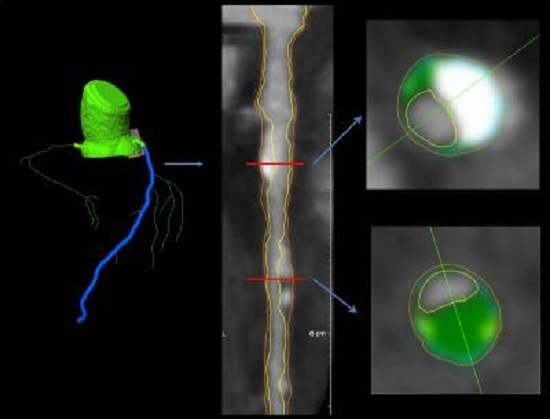 Coronary Computed Tomography Angiography (CCTA) has emerged as a viable screening option for plaque, including non-calcified plaque in earlier studies. CCTA can capture the full anatomic map of the coronary arteries in a single heartbeat with low radiation dose and provide a complete picture of the total amount of plaque throughout the arteries of the heart. For the current study the team used CCTA to assess the relationship between calcified and non-calcified coronary plaque burden in the coronary arteries and cardiovascular risk factors in low- to moderate-risk asymptomatic individuals. The researchers recruited 202 asymptomatic men and women over age 55 who were eligible for statin therapy. CCTA was performed using a 320-detector row CT scanner and an intravenous contrast agent. Coronary wall thickness/plaque was evaluated, and analysis was performed to determine the relationship between risk factors and plaque. Controlling for all risk factors the results showed that total coronary plaque index was greater in men than in women. Non-calcified plaque index was significantly associated with greater systolic blood pressure, diabetes, and elevated low-density lipoprotein (LDL) cholesterol level. The team surmise that these results highlight the potential of CCTA in quantifying plaque burden to assess progression or regression of coronary artery disease in low to moderate risk individuals. These images are of a 62-year-old man. Left: coronary segmentation model of the coronary tree. Middle: a curved multiplanar reconstruction of the left anterior descending artery, with the lumen and external vessel walls marked. Right: representative cross-sectional images, with green shading is noncalcified plaque. Credit: Image courtesy of the Radiological Society of North America.